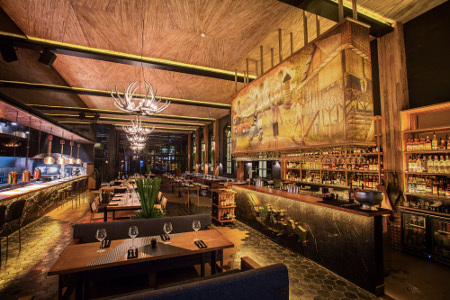 Ushers by Design create a stunning 2-storey complex in Bali consisting of a woodfire restaurant and lounge club area. A vendor we work with connected the client to us. They had heard of other designs that we had accomplished here in Bali. They wanted to create something spectacularly unique. 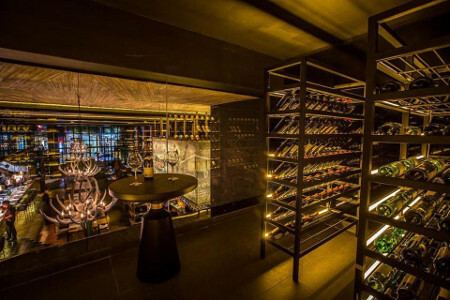 The client gave an initial brief of wanting two different concepts under one roof: • SALAZON: a wood-fire restaurant with butchery, wine room, and private dining on the ground floor, • ENVIE: a lounge club on the second floor, that included an additional mezzanine level and stage for live performace. The client wanted incredibly unique designs that would raise the bar in design on the island. We were then allowed to create and present the concepts. Our creative freedom is key, we love being provided with space to utilise our talent and imagination to the fullest potential. The Client wanted to use Indonesian talent, wherever possible, whether it be for a supplier or an artist, so it was key to use materials sourced locally. We use local artists, designers and suppliers wherever we can, that’s an important part of our ethic as a company and this authenticity is clear. 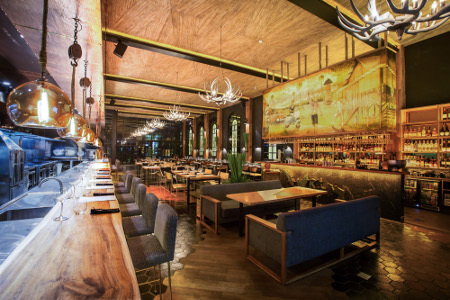 For SALAZON we created an eclectic, elegant space, that creates a comfortable and inspiring dining experience. For ENVIE, the guest is transported above in the elevator to a magnificent, vast space. There had to be an industrial feel to both spaces, due to the design of the structure. 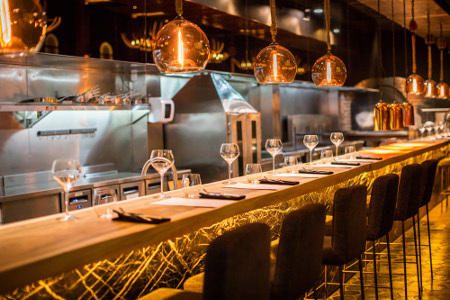 Materials We used beautiful long lengths of suar, that create a spectacular, seemingly endless dining bar facing the open kitchen of SALAZON. Teak wood is a mainstay feature of many of our designs, and we used it in both venues. 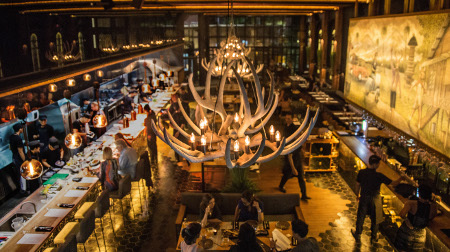 There are wonderful, grooved teak wood paneling is used on the ceiling in SALAZON, and there are carved deer antler chandeliers suspended above. The flooring in ENVIE is wire brushed parquet, with big slabs. We love steel at UBD. If you see any project that we have done, steel is a big part of it. It has a strength and a delicacy to it and you can create many different finishes and textures. All of the loose and fixed furniture are custom designs. Fabric selections vary to add to the overall eclectic concept. Digital Art Light Boxes We also wanted both spaces to have elements of imagination and to draw guests in, as their eyes wander around the room. We used light boxes with digital art in both. In SALAZON, The light box with the deer above the service bar was a really cool thing for us to create because we are in Bali. The mountains, a joglo, temple, VW and Vespa, all of these elements are known in Bali for a long time. The deer family are a further twist of (un)reality. But then upstairs in ENVIE, I researched the skylines of cities around the world, and commissioned the artist to create illustrative digital art for those cities – Jakarta, to honor Indonesia, London, New York, Paris, Hong Kong and Sydney. A creative movie background around the world was of immensely helpful for me to transcend my experience into the interior design world. With an eight-year residency in Bali, my team and I have created over 13 uniquely stunning commercial and residential projects around the island. Our supplier network is really very solid, with new suppliers entering our world with every new project we take on. Every project becomes more efficient because we have built relationships with our suppliers who understand the level of quality we operate around. ENVIE LANE is a 2-story complex, with SALAZON restaurant on the ground floor, and ENVIE Lounge above. 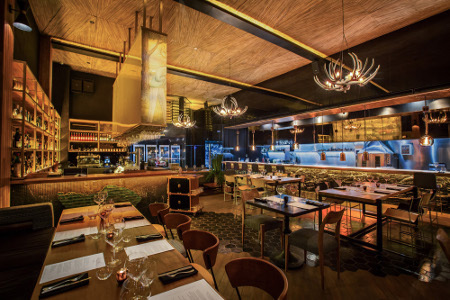 SALAZON is a woodfire restaurant, that seats only 96 guests, with elements of an open kitchen with dining bar, service bar, wine room, private dining room, and a butchery. It is a large, long space, 350sq m, so we deliberately created an amazing vista for the customer as they walk in. The eye is drawn to the far reaches of the space where the wine room and butchery are located. 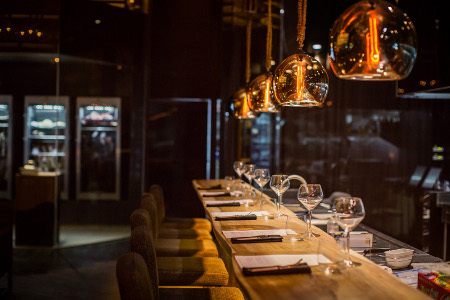 From SALAZON, you are elevated up to another environment, where it’s completely different from the ground floor restaurant, in that it is a vortex. And this time, this vortex takes you through elements of colours, lighting, and surface design. ENVIE is lounge club on the second floor, that included an additional mezzanine level with VIP seating and stage for live performace. And again, from the digital artwork on of the city skylines, and up to the celing with the 3D mapping of the universe, your eyes are taken upwards, to the ceiling that takes you out of your mind and to somewhere else. Always as a designer, you always create the concept, and then when the reality kicks in with client budget, then it is always a matter of compromise with the client on suppliers and materials. SALAZON - Ceramic maps of Bali & Indonesia - On the service bar there is a map of Bali. We custom-designed ceramic tiles, to create the Bali map. On the front of the bar, there is a map of Indonesia. These items are subtle, often taking a second or third look to recognize – it all adds to the feeling of discovery. - Flooring- We mixed teak wood and ceramic tiles for the flooring. It’s not a common technique at all but it provides a functional yet interesting contrast for the eye to consume Flooring detail is often not considered as an important aspect to the design but we’ve always considered it fundamental. - Light box with deer family - The light box with the deer above the service bar was a really cool thing for us to create because we are in Bali. The mountains, a joglo, temple, VW and Vespa, all of these elements are known in Bali for a long time. The deer family are a further twist of (un)reality. - Elevator - Everything in Salazon was custom-designed, even the elevator, of course it had to be. We created a casing design around the standard machinery and loading mechanism beautiful, automatic harmonica doors take you up to the 2nd floor club. ENVIE LOUNGE – - Light Boxes with city skylines digital art: I researched the skylines of cities around the world, and commissioned the artist to create within the colours I envisioned for the venue to do illustrative digital art for those cities – Jakarta, to honour Indonesia, London, New York, Paris, Hong Kong and Sydney. 3D Mapping on the ceiling – The eyes are constantly drawn upward, to the celing with the 3D mapping of the universe, it takes you out of your mind and to somewhere else. The roof design that we chose was not easy for the 3D company to execute, because of the sharp lines. We created that roof design style that would honour some parts of Indonesia, where this roof shape is very prevalent. But we also used the barn design so that guests would feel like they could be anywhere in the world, from Europe to New York, but then also including Indonesia. It’s two levels - From the ground level up, we created the whole building design, so there had to be relevance from what is downstairs to what is upstairs, but in a different way. It involves culture - Wherever possible, we included elements to honor Bali and Indonesia. These items are subtle, often taking a second or third look to recognize – it all adds to the feeling of discovery. On the service bar in SALAZON there is a map of Bali made from custom-designed ceramic tiles. On the front of the bar, there is a map of Indonesia. We researched animals that are/were indigenous to Indonesia for the arch windows. The same is true for the deer family in human form in Bali and the Sumatran hare artwork. Each piece is one of a kind. As mentioned before, we included Jakarta in the digital art skylines of the world’s great cities. It’s for the Instagram generation - It is full of eye candy, it’s a vortex where the eyes go everywhere. 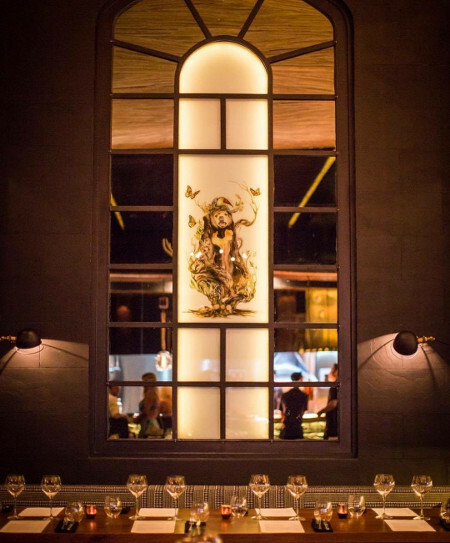 The arch windows showcase ethereal artworks of indigenous animals; over the bar there is a deer-human family taking time out in Bali's dramatic landscape. There is an enormous hand painted, Sumatran hare wearing headphones and leather boots guides your elevator ride from the restaurant to the upper floor. And upstairs The colors are all beautiful pinks, purples, blue, and fuschia colours, and they all have the stars behind them. Then that relates to the 3D mapping, which we originally wanted to create the universe, and project anything on that ceiling that takes you out of your mind and to somewhere else. We’ve built an incredible network of suppliers over an 8 year period of hard work. For this project, we were thrilled to source every material used within Indonesia, every piece of furniture and décor item was custom designed and made in Indonesia. This was key in order to meet the design brief, but also, as previously stated, the use of local suppliers and the local workforce is a key ethical component of our modus operandi at Ushers By Design. Whenever possible, we are very helpful to promote the wonderful artists whom we have worked with. Feel free to contact us for the information.